Thomas Pruchinski of LandingCube shares strategies for running successful Facebook ads for your Amazon listings. Facebook Ads can be an excellent tool for Amazon businesses to reach more potential customers, make more sales and build a more robust brand. In this article, we discuss why Facebook is a great source of traffic for Amazon merchants, discuss three common mistakes that sellers often make with Facebook Adsand provide tips on how to make the most of Facebook Ads. The Amazon marketplace is becoming more crowded and competitive. Sellers that combine an effective on-Amazon strategy with off-Amazon marketing are better placed to excel than those relying on Amazon alone. External traffic conversions result in sales and also increase rankings to deliver even more traffic and more sales. And there is no better source of external traffic than Facebook (unless you already have a giant email list). Facebook has the most powerful targeting tools available. You can target ads to an existing list (custom audience), to people similar to your past Amazon customers (lookalike audience) and to people who match the profile of who you think your target customer is (through demographic/interest/behavior targeting). Facebook has over 2.2 billion active monthly users worldwide. The chances are quite good that a large segment of your ideal prospects are on Facebook. And whether or not they are looking for your products on Amazon, you can get your products in front of them. Facebook Ads are qualitatively different than Google search ads or Amazon Sponsored Products Ads. Facebook Ads are visual & not triggered by search queries. People are shown ads because the data Facebook has on them matches the criteria of the audience. A Facebook Ad essentially interrupts someone. An effective ad gets someone to stop scrolling through Facebook and click on the ad. So, Facebook Ads allow marketers to reach potential customers from a totally different angle. and build a list of people hungry to buy future products. 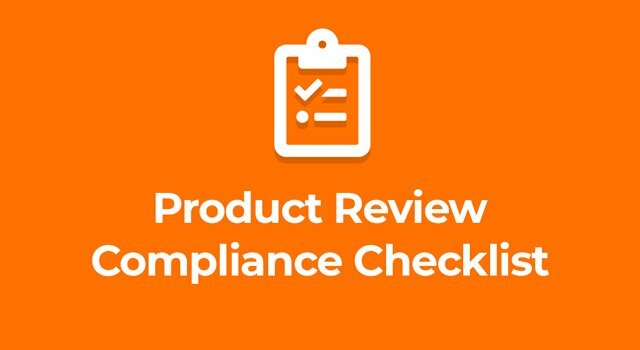 In my role advising Amazon sellers with Facebook Ads, I see a few big common mistakes. If you make them, you can end up wasting a lot of money. To make the most of paid ad spend, your listing needs to convert. You need to have a quality product that is at least somewhat differentiated from competitors and have a decent idea of who the target customer is. You need to give potential customers a reason to choose your product rather than another product. Even if you have a good product, a poor listing will not convert. What are the most important elements of a good listing? If you have a lame product and/or your listing is poorly set up, throwing money into Facebook Ads will be a waste. Above we discussed Interruption Marketing. Understanding this will explain why sending traffic straight to Amazon is a mistake. Traffic from Facebook, on average, is less likely to convert than traffic internal to Amazon. The average person searching on Amazon is in buyer-mode, or at least product-search mode. This is not the case on Facebook. The average Facebook user is much earlier on in the buying process. So if you’re sending traffic straight from Facebook to Amazon, your conversion rates will suffer. This negatively affects rankings. Essentially, you’re banking on a quick sale that is not super likely. A better approach than pushing a quick sale is to make sure you can stay in touch with a prospect (through retargeting, email and/or Messenger). That way, if they don’t buy then and there, you can lead them towards purchasing over time. And if they do buy, you can sell to them again in the future, ask for a review, etc. Rather than driving traffic straight to Amazon, using a landing page to build a sales funnel has a greater potential for higher returns on your ad spend. A landing page tool designed specifically for Amazon sellers, like LandingCube, allows you to reap the most benefits from Facebook Ads. The landing page serves to filter traffic. Visitors unlikely to convert bounce off the landing page, never reaching Amazon. And you can use the landing page to distribute coupon codes to further incentivize a sale. One of the downsides of selling on Amazon is that you don’t have access to customer emails and you can’t retarget them for repeat purchases. However, with a landing page you can collect emails and place the Facebook Pixel to build retargeting audiences down the road. These are seriously valuable assets. You can use them to remind prospects to buy, ask for reviews, launch future products and send additional promotions. The key to success with Facebook Ads (and digital marketing campaigns, in general) is experimenting and making decisions based on data. Split-testing different offers, different audiences and different ad creative & copy is essential to optimal performance. Many sellers understand that testing is important, but they execute tests poorly. They set up campaigns in such a way that the data doesn’t reveal which audience or which creative is best. An ideal experiment is testing only one variable. If you want to test two different audiences, then create one campaign with two ad sets that have different audiences. Nothing else should be different. Each ad set should have identical ads. If the ads in Ad Set 1 are different than those in Ad Set 2 (the creative, copy and/or destination URL is different), then there are confounding variables. Similarly, if you want to test ad creative, all other variables should be equal. You do this by creating copies of the ad (within a single campaign & ad set), and then switching out the creative, while keeping the copy & destination URL the same. But none of these tests are setup properly to yield useful insights. To test between email opt-in and no email opt-in, you should create two different campaigns where everything else is equal. To test between two images, there should be two ads within the same Ad Set that have the same copy but different images. To test between two copies, there should be two ads within the same Ad Set that have the same image but different copy. 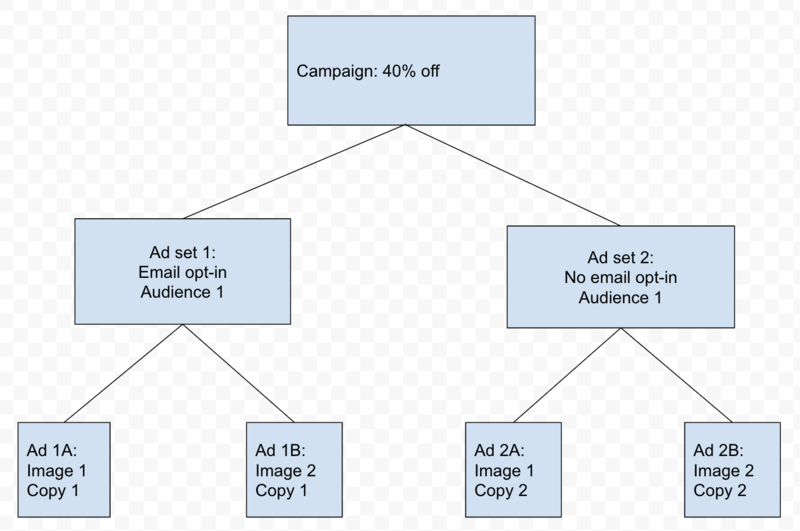 Also, the above campaign setup does not test different audiences, which is probably the most important aspect to test (keeping the creative & copy simple usually works best for Amazon promo campaigns). At the campaign level, we are testing between email opt-in & no email opt-in. 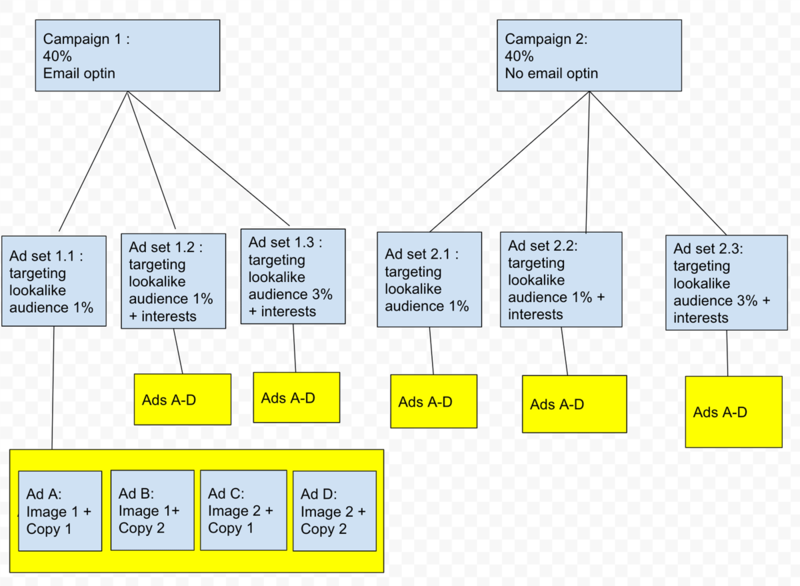 Note that everything at the Ad Set & Ad level for Campaigns 1 & 2 are equal. At the Ad Set level, we are testing three different audiences. And each ad set has versions of all four ads. Ad the Ad level, we are testing two different creatives & two versions of copy, resulting in four different ads. A proper campaign setup is essential to make use of the data that your Facebook Ads campaign collects. Once you build up about 1,000 impressions, you’ll have a reasonable indication of which variant works best. Then you can turn off what isn’t working, put more money into what is, and perform additional tests to continue improving overtime. Facebook Ads can be a great source of additional traffic and sales for Amazon sellers. If done correctly, they also make it possible to gain valuable brand assets (i.e. list-building) for future launches. For optimal results, make sure your listing is in order, use a landing page, and properly set up your Facebook Ads campaign to test different elements, especially the targeting audience. For step-by-step resources on how to set up Facebook Ads for Amazon, check out this free video course or written guide.